Here is a view of J Wood & Sons of Mirfield preserved Crossley DD42/7 bought in 1953 from Baxter’s of Airdrie where it was delivered new in 1949. She sports a Roe H56R body from either 1954 or 55 there seems to be conflicting information on the actual date, can anyone confirm? New 1949 rebodied 1954/5, five or six years does not seem all that long, is there a story behind that, and does anyone know what the original body was? She is seen outside Winchester Guildhall on 1 January 2010, visiting the King Alfred Running Day. Just for information. The 2013 King Alfred Running Day will, as usual, be on New Year’s Day. Sometimes, the event is moved, but no disruption for this coming one. The restored Leyland Olympic should be back in service and one of the members is hoping to have his 1930’s Paris Renault on duty. I have some information about the Crossley of Joseph Wood. The original body was built by Scottish Aviation. Two elderly coaches were traded in to Comberhill Motors of Wakefield to purchase the bus. This was the first double decker for the firm. Mr Colin Wood Josephs son related the facts to me. He was serving in the army in Korea when he received an angry letter from his father to tell him that on its first test it had failed due to bodywork defects. Colin suggested that they had the bus rebodied. At the time Yorkshire Woollen were having their wartime Guy Arabs rebodied so it was arranged that the Crossley would have similar bodywork. In 1954 the company scrapped the body and the head driver Mr Sam Land drove the chassis from Mirfield to Crossgates. On its return it entered service and was used on the joint service from Mirfield to Dewsbury alongside J J Longstaff and Yorkshire Woollen. For the next twenty years or so it went through two engines on the service its only escape was when Huddersfield Town Football club was playing at home when it was used on the excursion to the ground. Eventually the day came when the Crossley was due for withdrawal and so the ex Leyland Atlantean demonstrator KTD 551C was purchased. The Crossley was parked up against the garage and eventually became a tyre store. Colin had always wanted to preserve the bus and for the next few years he worked on the bus and had it reupholstered. On completion the bus looked splendid and one Sunday he invited friends and former employees and the bus made two commemorative journeys. Then the bus was kept at Keighley Bus Museum and was rallied frequently. Eventually it was decided to sell the bus and it was sold to Quanstock Motor Services and I read in Preserved Bus that the vehicle was for sale. If I win the Euro Millions Lottery it will be the first thing on my shopping list!!! Pete, you have raised an interesting question about the original body on this bus, and, surprisingly, the comprehensive ‘Crossley’ book by Eyre, Heaps and Townsin does not give a specific answer as far as I can find. The authors do make reference to five single deck SD42s bought by Joseph Wood, and then go on to state that Wood "acquired a second hand DD42 which it had fitted with a new Roe body", but neither the previous owner nor the original body are identified. The Scottish agent for Crossley was the Scottish Commercial Motor Co. of Glasgow, and it made the bodies itself on a number of its sales, but some were fitted with other makes of bodywork, including lowbridge examples by Roe. However, the following site www.sct61.org.uk/ confirms that the original body was, indeed, a Scottish Commercial product that was superseded by the current excellent Roe body in 1954. Clearly, some, at least, of the Scottish Commercial bodies must have been decidedly suspect to have given a life of only five years. Most of the wartime utilities managed rather better than that. Thank you, gents, for your comments on the origin of this bodywork. A fascinating read! I would say that the earliest the body dates from is 1954. I am basing this on deliveries to Leeds in that period all of which had deeper windows on both decks. By the arrival of the 1954 AEC Regents these were much shallower as seen here. However the bus is still an absolute gem and ideally should be repatriated north. I’m in complete agreement with David O, that it would have looked so much better with the Roe four and a quarter bay body, but I’m not sure if that style was available in 7ft 6in width, which this vehicle was. Around the same time, J W Moseley of Barugh Green, Barnsley had an ex-Sheffield utility Daimler rebodied with exactly the same style of Roe body. Chris The 4 and a quarter bay body was widely available so to speak from Roe Leeds standardised on 4 bays the half bay was (blanked off) from 1948 onwards and I think this was the Roe standard. One thing Roe often did for smaller operators was to tack their buses onto the end of a larger order which meant they got the same style of body but with a bit off the cost. It has to be said – a great looking vehicle even if it’s an ACV Crossley. Given the location of its owner, given the weather and, prior to smokeless zones, the output from household fires and woollen mill chimneys, the choice of colour scheme must have kept the bus washers busy. The Roe body dates from 1955 being completed on the 6th April that year. Was delighted to see this bus at Hanley but the engine was running flat no guts at all. Not sure what has happened to it recently but the last time I rode on it in 1999 at Keighley it had plenty of power then. Unfortunately the Hanley performance caused the running out in conversation all the usual Crossley negative traits. Shame after the effort myself with DBN 978 and the Birmingham 2489 Group have made to dispel this image! A quick question if I may, when did Woods actually finish?? The question of when Woods finished is around 1985 I forget the actual date. What happened is that they sold out to Abbeyways of Halifax who consolidated the Mirfield operation as Go Big Ltd and operations continued sometimes using buses from the Hyndburn hire fleet both double and single deckers but a bizarre purchase was a Leyland Leopard with an Alexander body that had once been a Leyland demonstrator abroad that operated on a Q plate. I remember that it had the destination for the Mirfield to Dewsbury service painted on the destination glass. Later on selling this bus the new owner had it rebodied by Plaxton.Eventually Abbeyways wound up the Mirfield operations and the depot at Lee Green Mirfield was sold to Ron Lyles who moved there from Batley. Later he moved his operations back to Batley and the depot was pulled down and Old Peoples flats were built on the site. Thanks very much for info Philip. I will see if there’s anything in ‘Buses’ for that year. I believe this bus is now in the care of the Dewsbury Bus Museum. It turned up as a ‘special guest’ at their March open day, still in pristine condition. Unfortunately it was parked in a corner and my photo did not do it justice. A comment from Chris Hough dated 20th March concerning Bolton ABN213C mentions this ex Demonstrator Leyland Atlantean operated by Joseph Wood and Sons of Mirfield, West Yorkshire. It has a Sheffield design Park Royal body and it ran on the Mirfield to Dewsbury service which was joint with J J Longstaff & Sons and Yorkshire Woollen District. Its livery with Woods was slightly modified from that which it sported as a demonstrator. The photo was taken in September 1979 by which time the bus was 14 years old. The bus has another claim to fame. I have a newspaper cutting dated July 1966 headed PRINCE OF THE ROAD which tells of a visit by Prince Philip to Leyland Motors where he drove KTD ‘for a mile long drive on the test track’ and ‘returned the £8,000 bus safely’. A photograph with the inevitable 007 route number records the event. Amongst his passengers were Sir Donald Stokes, Managing Director of Leyland Motors together with Chairman Sir William Black. Yes KTD replaced the ex Baxters Crossley that is now preserved and currently up for sale at Quantock Motor services. 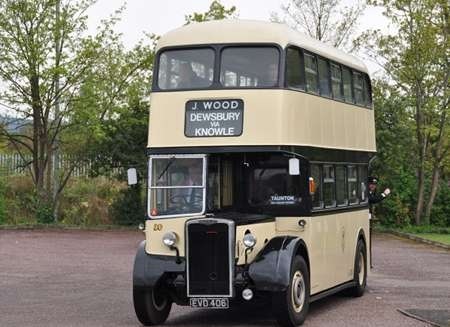 The plaque describing the driving by the Duke was removed before the bus was scrapped and is owned by Mr Colin Wood the son of Joseph Wood. While it was a demonstrator the bus served with the Wallace Arnold subsidiary on the “Kippax and District” route from Leeds via Halton, Crossgates and Garforth to Kipaax and Ledston Luck – again with the somewhat tiresome “007” in the route number display. The livery of this bus, to me, looks modern and gives a more modern appearance to the vehicle than might otherwise be the case. I like the way the ‘W’ has been incorporated in the waistline stripe. Simplicity is usually best. Oh how I agree with Chris regarding the livery style of the Atlantean and even more with his view that simplicity is usually best. The concept of a simple refined livery and layout appears to be totally forgotten nowadays with swoops and slashes and assorted disjointed shapes which bear no relationship to the lines of the bodywork in fact they seem to be deliberately “designed” to jar and clash. The new First livery is a glaring example of this both inside and out, I also find the Stagecoach layout to be unpleasantly disjointed and the interior rather garish. I agree entirely Diesel Dave – public transport has never looked more appalling and meaningless – at obscene expense. Managements insist that such horrors of marketing actually increase passenger numbers considerably, but I doubt if the artwork is the reason at all. I bet a straw poll of folks in the street would reveal conclusively that hardly a soul has any idea, or the remotest interest, – IF the vehicle is on its branded route, often they are not for obvious operational reasons. Thank goodness for the restrictions imposed by, I believe, TFL which ensure that buses in the Capital are practically pleasing red all over. Digressing very briefly, the same unsightly nonsense applies also to the railways. I look out of my flat at Headingley station a quarter of a mile away and see the Northern Rail trains all day – anyone would think quite justifiably that the Depot yards had been invaded by an organised army of aerosol wielding graffiti louts. I despair. Weren’t they a rather pleasing Maroon/Brown/Dark Green colour with a large gold ‘N’ originally (I’m colour-blind, Chris Y). I too agree with Diesel Dave, particularly about the First livery, just when you thought it couldn’t get any worse, it did! The truly insipid pastel shades introduced a couple of months ago were, I understood, to have provision for local identity but I haven’t seen any evidence of such. The new Wright bodied deckers for First Manchester bear the words ‘We believe in improving your bus service’ Hardly a convincing message when they’ve recently been fined a quarter of a million pounds for poor performance! My local operator, Trent Barton, not only route brands but has a different livery for each separate service with just about every colour on the shade card being used. The downside of this is that many passengers think that they are all operated by different companies. Sure, they’ve won ‘Bus Operator of the Year’ a couple of times but although such awards are coveted within the industry, I doubt, as Chris Y says, they mean anything at all to people in the street, none of whom had a vote! To be perfectly honest Chris H there have been so many railway livery changes in recent years that I’ve lost track (Oh dear, I promise no pun intended there) of the time and detail boundaries. The simple but pleasing WYPTE (Metro – that poor over used word again) colours were plain maroon with a light custard band – individual, sane, and universally understood. When the franchise was gained by Arriva the trains were painted in that Organisation’s colours of pleasing mid blue with the “cow’s horn” cream section, again excellent. I do vaguely remember the plain gold “N” but I think that this was applied only temporarily to stock remaining in Metro maroon and cream (gold). The basic Northern Rail colour is a quite rich and pleasant “regal” blue and the “N” logo is OK, but then the rot sets in. The wild and totally meaningless (and expensive) coloured graffiti shapes have to be seen to be believed, as have huge pictures of town halls and waterfalls and so forth. Sorry to seemingly digress onto railways, but the atrocious waste of money and disfigurement of otherwise handsome vehicles is a parallel scandal to the one we are discussing on the buses. One exceptional disfigurement, Chris Y, was dinosaurs on the IoW 1938 LU stock. One, at least, now carries true 1938 livery with silver roof and richer red, as befits a 74 year-old! Yes, Chris Y & H, I agree with your aversion to the manic and illogical bus and train liveries now so common throughout the UK. However, one notable exception is the smart Grand Central Railway livery which (so far) has not fallen under the influence of their new owner – Arriva. How I agree with the comments above on “modern” liveries, most of which seem to be the product of ecstasy induced nightmares. The preposterous original version of the “First” (how supremely ironic a name for such a company) Barbie livery had the grubby white/pink/purple shades blending into one another. Whoever devised that, and I expect that a consultancy firm received handsome payment for the aberration, had no concept of the practical world of panel damage. Not only are such liveries painful excrescences to the eye, but the over tight grasp exerted by the big groups upon their maintenance budgets is painfully apparent in the appearance of external paintwork. The older, and by no means old, buses of my local Stagecoach outfit are scruffy in the extreme. They bear absolutely no comparison with the impeccable fleet standards offered by the nearby Delaine and Norfolk Green businesses. The version of First’s livery to which Roger Cox refers was known as ‘Barbie 2’ and used for older types of vehicle. Many may may not realise that the ‘fading shades’ applied to the lower panels was actually an enormous vinyl that was a nightmare to apply, requiring several people several hours to wrap it around the entire bus, trimming and snipping around the wheelarches, fuel filler and other access flaps, grilles, lights etc. It had to be fitted around all the beading strips between the panels and around the wheelarches, but inevitably bubbled up, split or peeled away round the edges. If any oxidation occurred in the aluminium panels it would form large bubbles which someone would always be tempted to burst. The bus washing machine then had a field day with it ! Repairing minor accident damage was then very difficult. One depot actually started to cut the vinyls down by half into a narrower strip, eliminating the fadeout effect, but looking equally silly. I don’t imagine anyone involved with maintaining the buses was ever consulted about the practicality of it all. Nothing really to do with this subject. But John Stringer mentions a word I hate… Consultants. I’m sure John will remember the time at WYPTE, when a consultant said that there was no need for 2 vehicle workshops based on Kirkstall and Thornbury, so Thornbury went. Then a couple of years later another consultancy came along and said there was a need for central workshops in either division. Personal titbit, worked with Colin Wood when I worked at Abbeyways 1994/5. Great bloke, good sense of humour. The new”local livery” now used by First is little better using a pale lilac that will surely fade quickly Far better to use proper local colours based on the former colours of constituent companies. You can live in hope Chris, but I fear you will die in despair! Sadly Eric I fear you are right! I’ll just go and put my tin hat on! Why indeed Stephen – I’m sure that 99.9% of folk to several decimal places agree with you. I find the new “First Leeds” local “livery” to be as bad and un-necessary as anything before it. Who on earth wants to pay towards silhouette pictures of local landmarks concealed within the “LEEDS” lettering ?? This discussion seems to be getting further and further away from the attractive outline and livery of this Atlantean. Am I right in thinking that this same Park Royal style was used on Birmingham’s KOX…F series? It’s pleasing to know, however, that there are still SOME operators who use liveries of a traditional style. Delaine, Pennine, and a few others are well known. Here in Hampshire, there is a father and son operation XELABUS, based in Winchester and Eastleigh, using the old Hants & Dorset livery. Very nice, too! Xelabus are operating Southsea’s Open Top Sea Front service (X25), from Gun Wharf Quays to the Royal Marines Museum, Eastney, via Clarence Pier, Blue Reef Aquarium and South Parade Pier, but only on Saturday, Sundays and Bank Holidays throughout the summer: daily during the Summer School Holidays. The original CPPTD route ran from Clarence Pier to Hayling Ferry. They have kept the original route number, which was 25. Wonder what vehicles they will use; certainly not Leyland TD4’s! A nice write-up on Xelabus in the latest “Buses” magazine (No.687 June 2012) states that the principal bus to be used will be an ex-Lothian Atlantean, GJZ 9571), originally registered BFS 14L. The reserve vehicle will be an ex-Portsmouth Atlantean, No 11 ERV 251D. This is one of their heritage fleet. I don’t know what liveries these now carry – haven’t been to Southsea to see them yet, even though I’m local! So we’re getting back on track with the comments – two Atlanteans, albeit with different bodies (Alexander and Metro-Cammell) to the original Park Royal one at the top. What happened to Woods? Didn’t they become part of the Abbeyways “group”, but then what . . . ? I remember that, in the 1980s, they ran an ex-Singapore Alexander-bodied 12m Leopard (in Abbeyways livery)on the 205 (as the Dewsbury-Knowle-Mirfield route had become under WYPTE numbering), but then they seemed to disappear – at some point. Incidentally, Longstaff has recently given up on this route – its timings have passed to Lyles of Batley, although Metro publicity still refers to operations as being conducted by “Longstaff of Mirfield”. Anybody know the story here? Anyway, what were Wood’s colours? I’ve always assumed they were black and white – because they look black and white in the only photographs I’ve seen, which are black and white . . . errm . . .
As stated Joseph Wood and Son was purchased by Abbeyways under the guise of Go Big Ltd. The livery was always Black and Cream. The depot was in Lee Green Mirfield and shortly after Abbeyways had wound up the operation it was sold to Ron Lyles of Batley who afterwards moved back to Batley. Then the depot was demolished and today there is now old peoples flats there. With regards to J.J. Longstaff earlier this year the operation along with the two buses was sold to Albert Lyles Coaches who are trading on the service as Longstaffs. The only difference is that the service now starts and finishes at Dewsbury whereas before the service started and finished at Northorpe where Longstaffs garage was. I worked for Abbeyways in 1993/4. I remember being sent with a message for Colin Wood one day at a garage which had the Crossley in under restoration, and I think a coach in the Abbeyways livery that had been withdrawn sometime. It certainly was not Luck Lane in Huddersfield, and I seem to remember coming away from there and turning right on to the A62 towards Leeds, but I couldn’t tell you if that was the Woods Depot, although the Crossley was a big clue I suppose. Going by what Steven Ives did in Blackpool with Abbots Coaches, then it is probable that apart from the name he bought nothing. Happy to be proved wrong on this but that is certainly what he did in Blackpool. I seem to think though that Colin Wood lived next to this depot, and part of the deal was for him to keep it. Somebody out there will probably know. It has been interesting to read some of the comments here regarding peoples’ preference for traditional livery applications. I personally never liked this particular design of body. It was basically a late-in-the day attempt by Park Royal to disguise its original MCW-style box to compete with such as the superb Alexander design, and in my opinion it never looked right in any livery. Oddly, Roe – part of the Park Royal Group – managed to do quite a good job of updating the low-height version by adding an Alexander-inspired front to Atlanteans for West Riding and King Alfred. I thought they looked really good, even though mechanically they were perhaps not so. I am afraid that I do not believe that Wood’s livery did this one any favours either. The band below the lower deck windows just looks wrong – too thick and set too low – as does the total absence of relief colour on the top half of the bus. I think if it ever looked even passable, it was probably when in its original demonstration livery. I am in agreement with most about preferring the traditional liveries of old, though many would be just too fussy to transfer comfortably to the lines of certain modern buses, and would need simplifying. A number of operators over the years have revived an old livery on a new bus to celebrate an anniversary. Many have looked really well, but some looked really awkward and self-conscious. I have always thoroughly disliked First’s livery, but am staggered frankly at their latest mess. I have to admit that as modern liveries go, some of the Blazefield/Transdev companies schemes seemed to be quite good – strong, distinctive, contrasting colours applied quite simply. I had rather hoped that when Giles Fearnley moved to First some of this influence might have come with him. Instead the new ‘style’ is pale and wishy-washy, with odd stripes here and there for no apparent reason, starting and finishing in the middle of nowhere. It looks like it was designed by a committee to me. A thorough disappointment. Regarding the operation by Abbeyways of Joseph Wood mention has been made of the ex Singapore Leopard demonstrator that was used on the service from Dewsbury to Mirfield. My recollection is they also used buses from the Hyndburn hire fleet both doubles and single deckers and for a while they ran service 208 from Dewsbury to Whitley. The depot Chris Ratcliffe visited was at Lee Green Mirfield as mentioned in my earlier posting. I have never found out why Abbeyways gave up operations at Mirfield but this seems typical of Steven Ives. Lets hope for a return to some traditional colours in West Yorkshire. I’ve heard on the rumour mill that First has put everything in Yorkshire (and more possibly) up for sale with the exception of Leeds – including the York operations it invested in quite heavily a few years back. That might explain why I haven’t seen any Halifax/Bradford/Huddersfield names on the new livery (what would First have chosen as the sky-line for “Bradford”, given the present state of the city centre [non] redevelopment? – a pile of rubble??). Are First planning to pull out of Sheffield? Whatever, come on Transdev, come on Go-Ahead, buy in there and re-invent (I agree with John, you can’t always resurrect) some of the wonderful liveries from the past. We could debate the aesthetics of this Park Royal body style against its contemporaries, but it still looks way better than today’s offerings – and, moreover, it doesn’t look like it would fall apart when it hit the first stone/pot-hole in the road. I am intrigued to learn that First are now pursuing wholesale withdrawal from West Yorkshire. One wonders what this group’s business plan now is, as it seems to be getting out of some major conurbations. It withdrew from Kings Lynn a couple of years ago, where the operations were taken over very effectively by the smart fleet of Norfolk Green, whose livery is very much in the traditional style. Since then, Bury St. Edmunds has been abandoned. Perhaps, after the initial flurry of manic, cut-throat competition, and then the establishment of large regional monopolies, we are about to see phase three of the deregulation scene, with the expansion of soundly established independent operators into the “vacated” areas. I hope the rumour mill is correct certainly Rotherham seems on its last legs and Stagecoach are proving a viable contender in Sheffield If only Leeds would also go to someone with pride in what they do unlike First with their poor quality take it or leave it attitude. Despite early bad publicity – often either malicious or simply incorrect – Stagecoach has developed into one of the best groups around, along with Go-Ahead. As someone who does not have shares in Stagecoach but an informed observer, this pleases me. I, like many others, would be happy to see First disappear from South Yorkshire – and many other places too – but feel that it would be unhealthy if Stagecoach were left to it themselves. I agree that the best situation would be for a decent independent to emerge. Failing that for Go-Ahead to come in and support “healthy” competition. Roger, the actual words used by First were ‘We may have to re-position our UK bus portfolio’. That was when they felt the need to issue a profits warning earlier this year. That’s what it’s all about, unfortunately, their primary duty is to make a profit for their shareholders, but how is it, that some seem to achieve this in a better way than others? I agree with the view about Stagecoach, some of their tactics in the past have been despicable, but they do appear to have become one of the better players. How many times have you seen the words ‘municipal pride’ attached to many of the old council operations? What a great shame the former municipals in South and West Yorkshire, in their present day ownership, have become very much a case of profit first, service second! Just returned from a weeks holiday in Cheltenham were we travelled just about everywhere by Stagecoach. We made use of their excellent West Megarider gold ticket which, at £19.50 gave unlimited 7 day travel covering an area centred on Gloucester as far out as Hereford, Tewkesbury, Oxford, Swindon, Marlborough, Trowbridge, Chippenham, Lydney and Monmouth. There is also a good selection of smaller area runabout type tickets to choose from at varying prices. Excellent value when you consider the five minute journey from where I live into Halifax costs £2 with First. Whilst Stagecoach do have some competition from smaller independents in the Gloucester/Cheltenham area by and large they seem to “rule the roost” with there network of services yet still provide a ten minute frequency from the suburbs into Cheltenham plus the ten minute frequency between Cheltenham and Gloucester using high quality double deckers (leather high back seats etc.). One must also bear in mind the largely rural nature of most services once out of the towns and cities. Being visitors to the area we also found the drivers willing and helpful in answering our queries. Usually, once a year, I go for a Grand Day Out, by bus, with a friend. However, on a Friday, last summer, I got the megabus from Gloucester to Swindon, a Stagecoach West bus from Swindon to Andover, then used Stagecoach Hampshire to get to Winchester, where a friend lives. We came back by car on the Monday. I got some advance advice from Stagecoach West, not for the first time, and have always found them to be helpful, making enquiries of their neighbouring colleagues, where necessary. They have also re-introduced a through service from Gloucester to Hereford and later buses on Gloucester’s routes, now leaving town centre at around 23:30hrs. My local town service had a 15 minute frequency during the day, hourly after 19:00hrs. I have no connexions with the company. Local Gloucester independents are Aston’s, Pullen’s, Swanbrook, Jackie’s and Mike’s Travel. The days of National Welsh and Midland Red, who ran an express service to Birmingham, are long gone! Other routes went to Abergavenny and also Cardiff, although the latter route has been progressively cut back to Newport, then Chepstow, now Lydney! When I attended the Harrington Gathering at Amberley, I got chatting to a Stagecoach employee from Brighton. Among his comments about my life in Southern Hampshire was one that falls in with several above. The recent service changes which First made here a couple of months ago were an utter waste of time and money. I had heard from several of the local drivers and inspectors that it was a last ditch attempt to generate more than they were spending, but the chap from Brighton said the other groups between them give First six months before collapse. 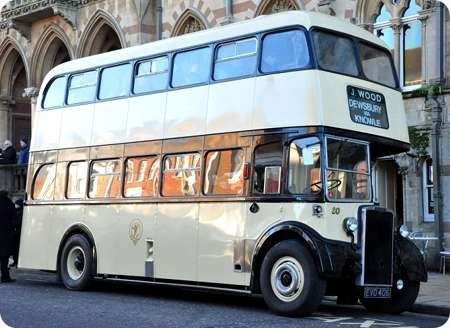 This was Woods last decker and was replaced by a Plaxton bodied Leyland Leopard The body design although mainly associated with Sheffield was also bought by Birmingham Leicester and Salford. Sorry to contradict the comment about KTD 551C being the last decker.It was replaced by an ex London DMS TGX 769M.Incidentally the Leopard mentioned had its Plaxton service bus body scrapped and the chassis was sold to Stanley Gath of Dewsbury who had a number of older chassis rebodied but for some reason this never happened and the chassis was dismantled for spares. This is a bit off topic, I know, but relates very topically to the issues discussed above, and very indirectly to Woods-will the “Woods” return? Metro, that is the West Yorks Transport Authority have today announced a plan to take control- as they may- of local buses in terms of “quality contracts”- supposed to be like London, but sounds like the Railways to me, too. Bus passengers have plummeted: presumably the idea is to make the buses run where they are needed, on time, at approved fares- and most importantly, turn up at all, on some routes. In my youth it was unthinkable that the bus would not turn up… that attitude- the Woods or Ledgards or some of the old Municipals- is what we need. Presumably First got wind…. Thanks Philip I’d forgotten the DMS The other independent Longstaff ran an ex Devon General tin front AEC Regent III for a while and bought a long wheel base Atlantean with NCME bodywork which ran for the late lamented Black Prince for a time. The Leyland Atlantean of J.J.Longstaff was sold by Black Prince and eventually became a cut down recovery vehicle with Yorkshire Traction. I drove for Longstaffs in the late 1970s.Incidentally Mr Brian Longstaff the last surviving son of the founder John James Longstaff died a couple of years ago. As mentioned in these listings the family have sold the business to Albert Lyles Coaches of Batley who are still operating the service 205 from Dewsbury to Mirfield exactly as Longstaffs did. Nice to see the business (and route) going to another independent. I had a aunt who lived at Ravensthorpe and we occasionally visited for tea. After a while I would escape and go watch the buses passing by along North Road. These were on the joint YWD/Wood/Longstaff service mentioned, but it was interesting that it was only when Metro (WYPTE) took charge of timetables that all three operators’ timings were listed. YWD had stubbornly refused to mention the other two’s timings, giving the impression that it was only hourly instead of every 20 minutes. I remember Wood’s Crossley, and the replacement Atlantean, but there was also an ex-Glasgow Leyland Worldmaster – FYS 689 – which for a while ran with its original Weymann/GCT body before Wood’s rebodied it with a new Plaxton Panorama Elite coach body. It later passed to Tower Coaches who ran it for many years, although by then it had a later style Leopard badge, and sounded more Leopard than Worldmaster, so they may have replaced more than just the body. Worldmasters sounded distinctly different from Leopards – we had nine of our own in Halifax and I was very familiar with them (more of these another time). I seem to also remember a Burlingham bus bodied Atkinson single decker before that. Longstaff’s had an ex-LT RT – HLX 321 – which then gave way to a marvellous ex-Devon General Regent III/Weymann Orion (with ‘New Look’ front)of the PDV-registered batch, like the two that Ledgard’s had. This was replaced with the unusual Daimler CSG6/30 /Northern Counties LSN 286 with David Brown synchromesh gearboxes, that had been new to Garelochhead Coach Service. Longstaff’s too had a single decker, which was a Tiger Cub/Weymann Hermes, which I think was ex-Rhondda. Longstaff’s Tiger Cub replaced a far more interesting saloon, Sentinel STC4/40 OUP 579, which ran for them on the Dewsbury service from November 1961 to November 1965. The vehicle had been new in October 1953 (making it one of the last STC4/40s to be sold) and was originally operated by Trimdon Motor Services. Strangely TMS only kept it until February 1955 – most of their Sentinels lasted until the end of the decade before disposal. It then ran for a couple of contractors on staff services (an astonishingly young vehicle by most contractors’ standards!) before being acquired by LG Phillips of Glynceiriog in June 1961 from the Don Everall dealership. Three months later Everalls repossessed it (their version) or had it returned to them because it was rubbish (Phillips’ version) and then it went to Longstaff. The fact that Longstaffs kept it for four years, in daily service on a busy urban route, might help readers to make up their minds as to which version was true. It certainly looked very nice in Longstaff’s two-tone blue livery, and an excellent colour shot of it can be found in Geoff Lumb’s book “The Heyday of the Bus in Yorkshire” (Ian Allan). After withdrawal by Longstaff it went to another Phillips, this one of Shiptonthorpe, and gave another year of service on works contracts before being scrapped. Regarding John Stringers comment about Y.W.D not acknowledging that the service from Dewsbury to Mirfield was a joint service rang a bell with me. Longstaffs and Woods departed from the side of Dewsbury Minster yet the YWD bus left from the bus station on the other side of the road. Brian Longstaff once told me that they acquired a Saunders bodied London RT with a route roof number box. Longstaffs painted the number 11 on it and were given a sharp rebuke from YWD and were told to remove it which they did. Yet later when YWD were having a severe vehicle shortage a Longstaffs bus went on hire to YWD in the evenings and was crewed with a Longstaffs driver and a YWD conductor and of course this timing went from the bus station. One of the problems of fitting vinyl is that in corners there is a tendency for the vinyl not to fit right into the corner but take a short cut. If you could see a side on view it would look like a triangle with the vinyl being the long edge. This is called “tenting”. Inevitably the vinyl eventually tears (as it is under stress) or develops a hole, water is trapped behind it and creates a bubble that some are tempted to burst. Either way it can provide the conditions for rot to get a foothold. Vinyl comes in various grades and many operators choose the cheaper grades. Sunlight is not kind to it! In a similar vein: Contravision. Contravision is quite simply perforated vinyl. From the outside the eye sees the “big picture”. The eye doesn’t see the thousands of very small holes. In theory from the inside the eye sees through the holes to the outside view as this is brighter. I am sure we are all familiar with various optical illusions and how the “mind” can be confused. This can happen with Contravision where some just seem to see the inside of the vinyl. What causes the problem is the perforated holes fill up with grime / grease etc. Washing doesn’t seem to remove it as any brush glides over the top as the vinyl sits proud. The only solution is to literally pick out the grime from each hole – a fools errand. As much as advertising revenue is important to operators I seriously wonder if the long term loss to the business (in terms of customer perception and satisfaction etc) is greater. First of all may I make a comment about the ostensible ‘joint’ service referred to – and this will come a bit alien to anyone who wasn’t around at the time of Road Service Licensing. Longstaff and Wood operated a joint service, to the extent that it was covered by a joint Road Service Licence. 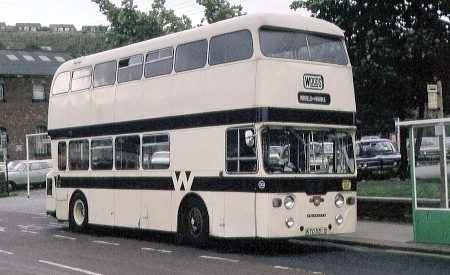 The YWD Service 11 was completely independent, even though it followed exactly the same route – except for the terminating arrangement in Dewsbury, of course. However the timings were coordinated to the effect that, between the three operators, a twenty-minute service was provided. The above, John S, is the reason why there was no mention of the Longstaff/Wood service in the YWD timetable – YWD would have had no more reason to include it than they would the service of any other operator which ran in its area. However there was a time (this would be the early 1970s, at least) when there was a separate section in the YWD timetable for other operators’ services – and the Longstaff/Wood operation was shown there, i.e. not in the same section as YWD Service 11. This showing of other operators’ services was widespread throughout the NBC at the time. Finally, Philip C, referring to the story of Longstaff going on hire to YWD, if the hirings took place in the evenings (rather than peak times), it sounds as though it was drivers YWD were short of at the time, rather than vehicles. I drove for Longstaffs in the early 1980s. Brian Longstaff once told me that on Sundays they were willing to have the day off alternating with J,Wood on a weekly basis but Alice Wood would not comply so the three services ran even though there was not enough passengers for one bus never mind three. Now a days the service does not run on Sundays and terminates at 8 P.M whereas when I drove we worked until 11.30.